Connemara Beaches - Connemara Coastal Cottages . Map of the main Connemara Beaches. 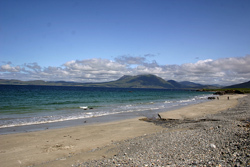 One of the greatest natural amenities of Connemara is its wonderful beaches. There are literally miles of Connemara beaches varying from little hidden coves to endless white strands and from surfing to sandcastles. 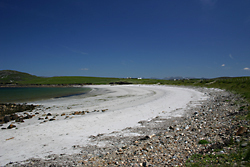 A number of beaches in the area have been acclaimed in the press, Dogs bay and Gurteen beaches near Roundstone often feature in top ten beaches, and the Coral Strand in Ballyconneely is a favourite too. Here are some of the best but by no means all as we cant give all the secrets away! 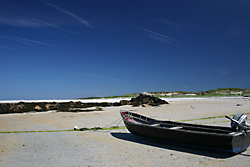 Experienced beach bums in Connemara can take a look at the tide times and the wind direction to find the most sheltered beach for the day. There are so many that you can always find one that is out of the wind, facing the Sun and with the best swimming in the area. Click on the markers on the map below to find the names of the main beaches.